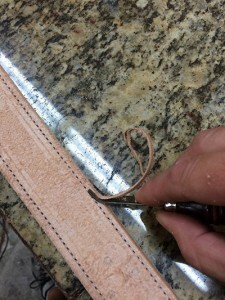 Everyone has a different process when it comes to slicking leather edges on their leather projects. There are always more than a few ways to skin a cat, but this is the process that I use and it works well for me. The first step is to sand the edges of your project with the sanding block until it is smooth. 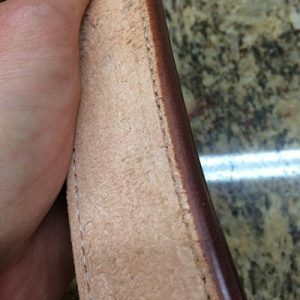 If you prefer you can use different grits of sandpaper to get the smoothest edge possible for slicking leather edges. The smoother the sanded edge the better the final slicked edge will look at the end. 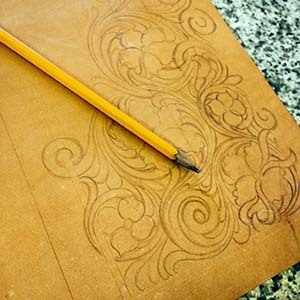 Next you will edge both sides of the piece with the size edger that is best for the thickness of the project you are making. 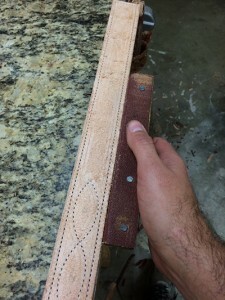 Usually the thicker the leather is the bigger the edger you will want to use. Play with different sizes to see which work best for you. 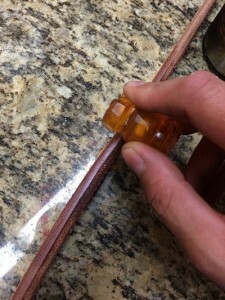 Once you have sanded and edged the piece, then I take the wool dauber and dip it into my little can of water and apply water to the edge to moisten it well. Just wet a section of the edge that you can slick quickly… usually for me this is 12″ or so at a time. If you get too far ahead of yourself the edge will dry before you slick it. After getting the edge wet, then I use the piece of glycerine bar to apply a light coat of soap to the edge. 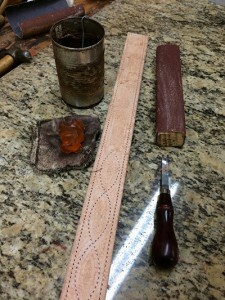 This will help the fibers of the leather to lay down easier and will speed up the slicking process greatly. Don’t use too much soap in this step! Too much soap will prevent a good hard edge and could stain the border of your piece if it runs up on the face of your work. Now that the soap is applied, use the piece of canvas to rub the edge of your work with firm back and forth motions until slick and shiny. On thicker projects such as saddle skirts or horns I will use a wooden rub stick before the canvas to get a good smooth surface first. The trick here is a lot of elbow grease. 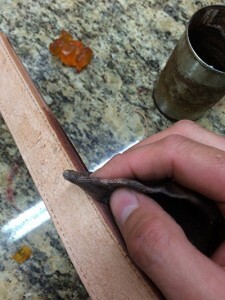 The shiny hard edge is produced in the leather from pressure and heat applied by the canvas. The water and the soap work to soften the fibers and allow them to lay down and then the friction of the canvas causes the heat that burnishes the edge fibers. much and send us some photos of your work if you get a chance! Be sure and subscribe to our mailing list to stay up to date on new things happening in the shop and future tutorials and videos.